When was the last time I had the fluffy white Wonder Bread? The soft, melt in your mouth bread that can be gobbled up in 2 seconds, perfect with PB & J…, Yum! But along the way with life, I somehow gave up the Wonder Bread many years ago and don’t miss it that much any more. People are more careful about what they are eating these days and the bread is one of the most important food item when it comes to that matter. 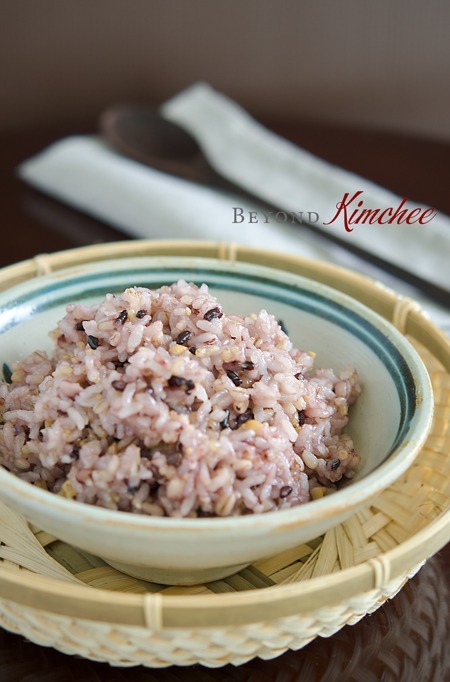 No, today’s post in Beyond Kimchee is not about the bread, actually. I am going to tell you how good it is to mix various grains and legumes in your rice. Just like the white bread the white rice itself doesn’t offer much nutrition to our body. The simple carbohydrate turns into sugar once entered into your system. Eating too much white rice? You might get the cutest rice belly! 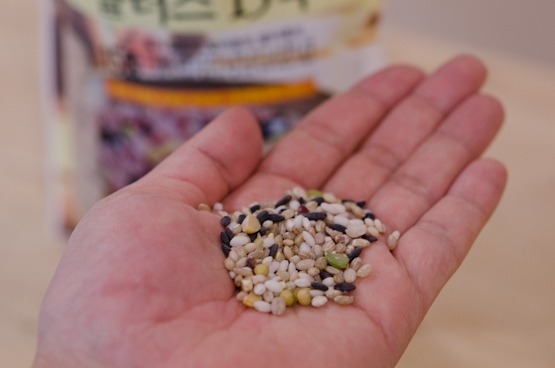 Many Koreans are be aware of eating healthy to achieve the *Well-Being* as a social trend, more and more people are giving up the pure white rice. 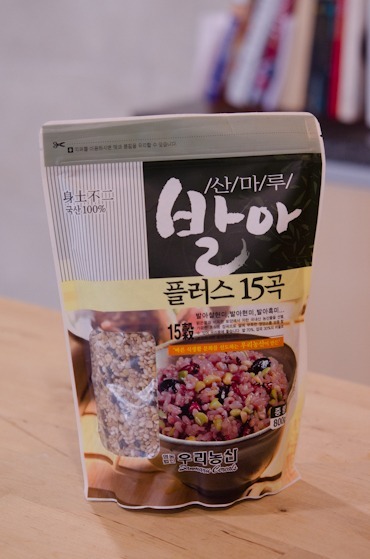 In fact if you visit any Korean household these days you will find the most families are enjoying multi-grain rice called “Japgok-bap (잡곡밥)” in their daily diet. I don’t need to explain the abundant benefits of eating the multi-grains. But giving a cold turkey to the white rice and switching to 100% brown rice can be harsh at the beginning. Brown rice alone is not that flavorful to enjoy. We know our rice. So, start with mixture of white rice and different assorted grains, then slowly increase your multi-grains and decrease the white rice. You can eliminate the white rice completely at the end, but like adding white flour in any whole wheat bread, you need a little bit of white rice to pull all together. My ultimate ratio is about 70% multi-grains and 30% white rice. A little white rice itself helps to digest the fibers and ease the stomach. You can collect all sorts of grains separately yourself or get the package that has the mixture. I would choose the later if I have the option. If you go to any major Korean grocery stores you will find the loads of mixed grain packages; from 5 up to 20 different grains and legumes. I chose 15 grains for today’s rice. Pick anything that appeals you and fits your budget. Some can be quite expensive. Here is how they look. Supposed to have 15 different types. I didn’t count. I tend to trust…, maybe I should have? The most common grains and legumes they add are; brown rice, glutenous brown rice, black rice, rice bran, all sorts of beans (green/red/black/kidney/black eyed/soy, etc), split peas, oat, barley, sorghum, millet, etc. My advice is to avoid the package that has too many kidney beans. I found the beans in the package tend to be too dried and some has too much. You can always add your own beans of choice. I often add fresh beans and even nuts like walnuts or almonds. I am going to use 1-1/2 cup of these mixed grains with 2 cups of white rice today. If you never had multi-grain rice before, this ratio would be the best to start with, and then adjust the amount of grains depends on your taste bud later on. Now the next important thing is having the right kitchen appliance to bring your multi-grain to its ultimate best. Using a pressure cooker is the best way to get the soft yet chewy grains. Two options. The left one is electric pressure rice cooker . All automatic. All you need to do is to push the button and it does the job for you. The down side? Expensive (about USD$400 and above). But it is a good investment if you use it often. The one on the right is a stove top Pressure Cooker . Much more affordable (about $70 for the good quality). You have to manually adjust the time and the heat yourself. It is not that difficult but needs a little practice before you are very comfortable with it. Pressure cookers are versatile. Not only for cooking rice to bring their best texture, you can cook porridge, oatmeal, beans, and even toughest meat can be very tender if cooked in pressure cooker within short time. Now, let’s start getting ready to cook! Rinse 1-1/2 cup of mixed grains several times and soak in the water for at least 30 minutes. I soaked mine for 1 hour. Mix with 2 cups of rinsed white rice. White rice doesn’t require soaking. Pour 4 cups of water. The best ratio of rice (un-soaked) to water is 1 : 1.5 based on white rice cooked in a regular cooker. Other types of grains need far more water than white rice, but since the grains are pre-soaked and we are using the pressure cooking it won’t need that extra. I like this type of rice to be on the softer side. If you prefer chewier texture, reduce the water by 1/3 cup. Most electric pressure cooker will come with several features. Mine has a multi-grain option so I selected that, and it is cooking. White rice only takes 20 minutes but mixed grain takes longer, about 35 minutes. If you use stove top, you want to start on the high heat to boil up until you hear the hissing sound and the tab on the lid shakes, then reduce the heat to low, simmer for 5-7 minutes. Turn off the heat and wait until it give off all the steam out. You provably need less water to cook your grains with stove top cooker. Play with it a few times and you will get a sense of how much water is most ideal for you. Done. Looks great. Imagine this healthy wholesome grains going into your body. Before you scoop out the rice to serve, toss the rice gently so that bottom and the top will get incorporated. I usually cook this type of rice more than I need and store the leftover in the freezer for the later use. I put in the ziplock bag and freeze them. To reheat, remove the rice from the bag and reheat in the microwave for 2-3 minutes. Your rice will be as tasty as freshly cooked. You can keep the rice in the fridge if you are planning to use it the next day. But rice looses its moisture very fast after 1 day and you will find them to become crumbly and tasteless after that. With this wholesome healthy goodness, you don’t need much to serve with. 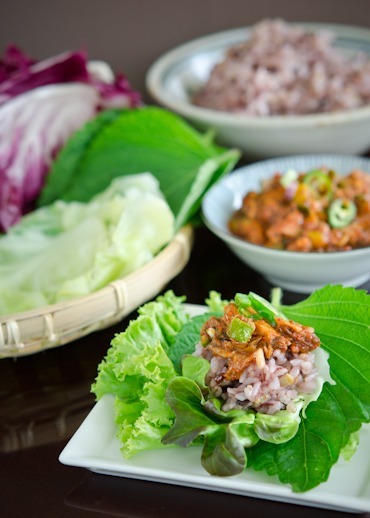 In my next post I will show you the awesome “Ssam-bap”, the Korean rice wrap with loads of lettuce and the delectable topping sauce that you can serve with this rice. 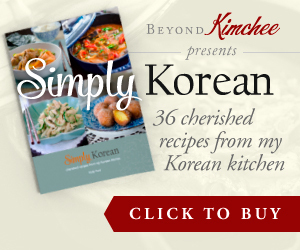 If you like the rustic flavors of Korean cuisines, you will love this. This makes me hungry so I better take my buns off from the chair. I will be back in a few days. 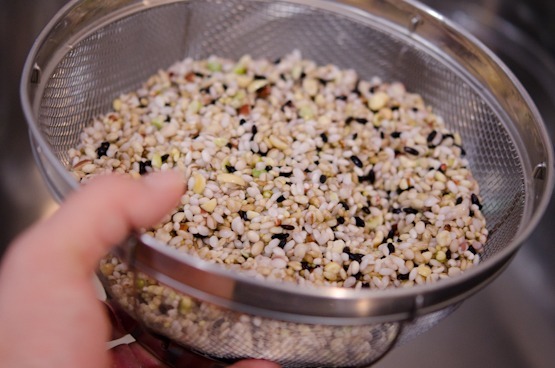 Rinse the mixed grains several times and soak them in the water for 30 minutes to 1 hour. Drain and set aside. Rinse the white rice. 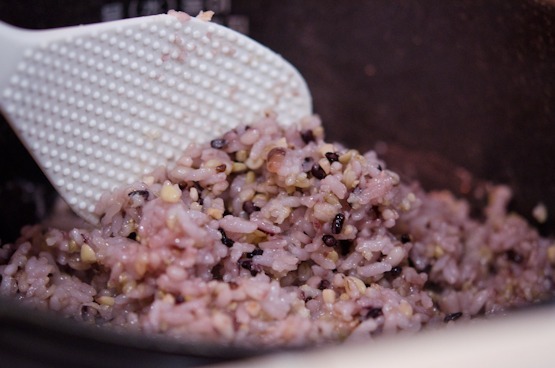 Combine the white rice and the mixed grains in the Pressure rice cooker. Pour 4 cups of water (or less) and set a multi grain cooking setting if you have. Or use brown rice setting on your electric pressure rice cooker. When done, toss gently to incorporate. If using a stove top pressure cooker, bring the pot to high heat. When you hear the hissing sound and the bell on the lid is shaking, reduce the heat to low and simmer for 5-7 minutes. Remove from the heat and let the steam to work its way. Once all the steam escapes you can open the lid and toss the rice all together. 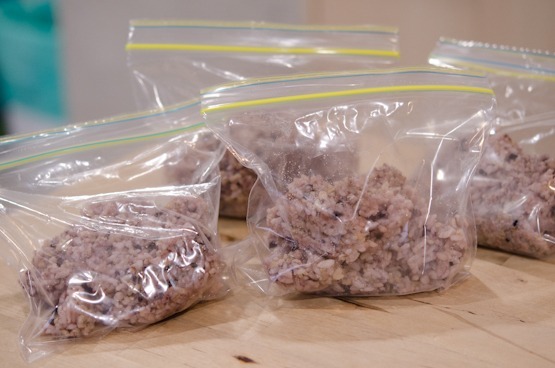 Store the leftover rice in the freezer for the later use. How would this work in a rice cooker rather than the pressure cooker. Would the rice/water balance need changing? Thanks. Bob, If you cook in a rice cooker, you will need to soak the grains longer, at least 4 hours to overnight. Try the ratio of rice:water to 1:1.5 first. It is hard to say the fixed ideal ratio when cooking rice, especially multi-grain, and everyone's preference on the rice texture is a little different. Some needs more water and some needs less. Try a couple of times with a little different ratio and you will get the sense how much water is most ideal to you. Thank you AK. You are so sweet. I heard that there are quite a number of Korean expats there. I wonder if there are any Korean stores. I will ask around and let you know. 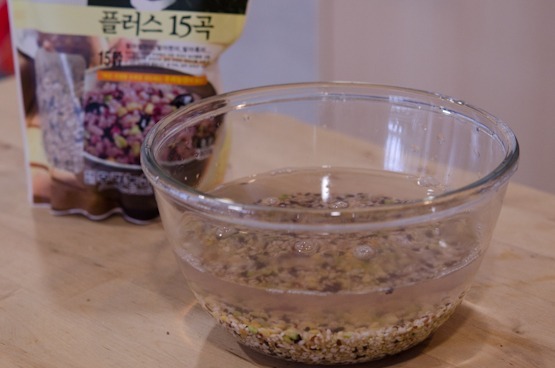 Hope you can access a few basic Korean condiments and ingredients, so you can make many delicious Korean dishes. If I have to pick the 3 most important Korean condiments, that would be Korean chili flakes(gochugaru), chili paste(gochujang) and soybean paste(doenjang). You can find soy sauce and sesame oil in most western grocery stores these days. If you wan to make Korean chicken salad, you will need Korean mustard but you can substitute with dijion if you can't get it. For Kimchi, you will need Korean fish sauce(comes from fermented anchovies) and some coarse sea salt. Have fun making Korean food this weekend. This looks really good! It's a lot healthier than white rice. I meant to change our rice to more healthier version but my kids and my husband refuse to change. I tried to introduce in different form (like rice ball etc) but they are just not used to it. Beautiful photography Holly! Thank you Nami. It is hard to switch from white rice. I would suggest to add a little amount of millet to your rice first. Millet are tiny grains and doesn't change much of flavor to white rice. Then slowly add a different grains each time. It is like introducing each solid food to babies, isn't it? Thanks Amy. If your families are tamed with brown rice, that is blessing! No need to go back to white rice. Adding some multi-grains is a fun change and delivers different flavor and texture. My family prefers multi-grain rice over brown rice alone. Yum! I will definitely have to try this. I love seeing your blog posts. I'm Korean but never cook Korean food aside from re-heating what my mom makes for me. Your recipes inspire me to learn to do all of this on my own. Thank you! Holly, I am so glad you posted this. I have been blending different grains and rice for awhile, and my family loves it. I made an aromatic rice made from organic brown and red rice for dinner the other day. My daughter had a friend over and she ate three helpings...of course teenage kids might be a little more open to the idea. Anyway, why I am so glad to see your post is I have been using a mixed grains from my Korean store and I found the legumes in it were not cooked right. I am happy to find out how to use it in my pressure cooker, and soaking it is a key! Thanks! One question do you find the white rice gets overcooked when using it with brown rice and grains that need longer cooking time? Hi Lyndsey You want to soak your brown rice and other grains but not the white rice. I cook them together and they are fine. Grains that have been soaked will cook faster and that will even out the cooking time with white rice. The white rice adds the stickiness where the other grains won't and helps to create soft chewing texture. If you use a stove top pressure cooker, you need to reduce the water amount more than the electrical automatic ones. I would start with small amount first to experiment and you will get a sense that how much grain:water ratio is the most ideal for you. Everyone has different preference on their rice texture. I like it softer side on the multi-grian. Hi Sook Yes, I am a Korean, of course, and LDS living in overseas. Congratulations on your new blog. It is always nice to meet a new blogger especially who is sharing a similar interest. Wishing the best luck and let me know when you launch. Hi, Holly. I have just discovered your blog (I came from Hyosun's blog) and I'm amazed by the beauty of your photos and the fascinating dishes I see here. I want to cook everything you post (well at least all the Korean dishes because I am a beginner in Korean cuisine, but I love every single dish I discover and prepare). I am crazy for perilla, use it whenever I can and I see it here as a wrap with lettuce! What a fantastic idea! This multi grain rice looks very unusual! I hope I can find it one day here and taste. Hi Sissi, welcome to my blog and thank you for the nice compliment. I love perilla leaves, too and lanning to post more dishes with them. Multi-grain rice is quite tasty and flavorful. I prefer over brown rice. Hope you get to give it a try. Really informative post. I haven't had Wonder Bread for years (decades!) but I do like white rice, even though I know of its nutritional downside. I should start cooking with multigrains more. And a great excuse to buy a pressure cooker! growing up my brother and i would call this 'purple rice'. so good! My kids call it 'purple rice' as well. They like to eat their purple rice. Where can I find the multi-grains in Singapore? There's Seoul Mart in Bedok mall and other areas. They sell the grains rice!! I made it but it tastes bland. What vegetables and spices can we add to make it tasty, moist and complete in nutrition? Thanks. This is a recipe for making multi-grain rice only, not a complete meal. It will taste bland without any dishes to go with. Hi, I bought the 7 mixed multigrain rice at hmart. My rice consists of brown rice, brown sweet rice, barley, red bean, black bean, black sweet rice, and mung bean. I had two bad attempts with cooking the rice. Both of my attempts were a big fail. I think I may have had the wrong water ratio. (I cooked it in a rice cooker under mixed rice settings). Can you let me know the ratio of rice I should use and the water? I'm cooking for myself and I own a small zojirushi rice cooker with mixed rice settings. I like my rice to not be too dried nor too sticky. Is it NECESSARILY to add white rice to the mixed rice? I mean my rice already have brown rice in it. 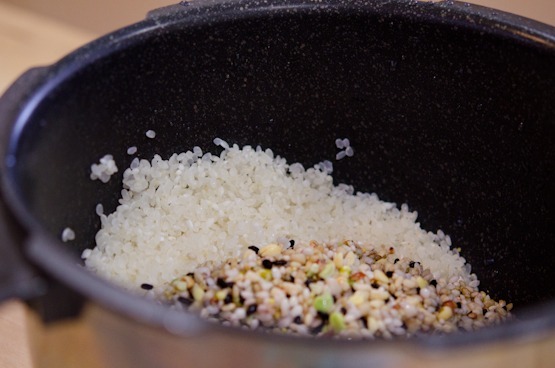 If you don't have a pressure cooker and using ordinary rice cooker, I highly recommend to soak the grains in the water for at least 4 hours or overnight in the fridge. Soaking will help cook the grains evenly and thoroughly. 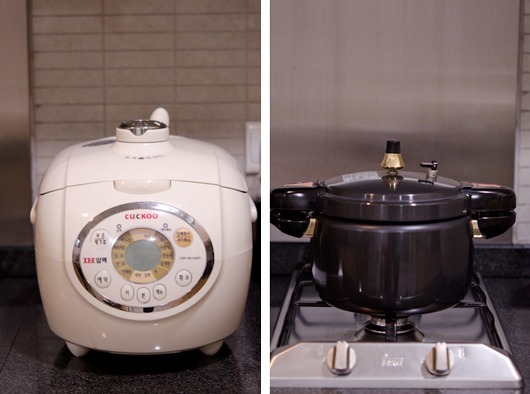 I would use 1:2 grains and water ratio for the ordinary rice cooker. This is how I make it. I soak the 7 mixed multi-grain in water for 24hrs. Normally you'll need 2-3x the amount of water as the rice, as they soak up alot. I put it in the refrig. Then I put it in my cuckoo for multi-grain setting. Here's the key. Soaked rice only needs small amount of water. I usually pour the entire thing into the rice cooker pot and drain all the water up to the same level as rice. It's comes out crunchy and soft. Even people are surprised how well it taste. You need 1:2 ratio because it's not been soaked enough. I used to do this, but it doesn't taste as good as soaking it in for 24 hours + and using less water during cooking. It usually cooks in 3hrs in my cuckoo. Mmmm! Looks good! Can I just leave it in my cuckoo rice cookers eat it everyday instead of putting it in the freezer or will the taste go bad? 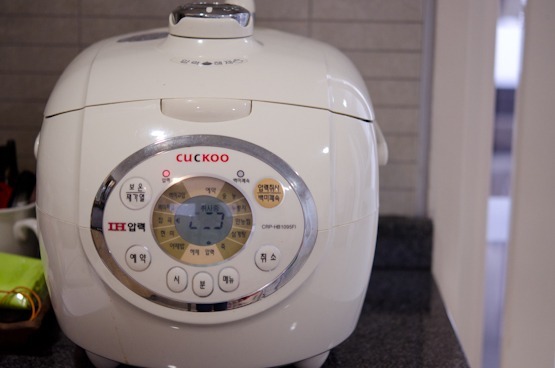 Also if I just want to make brown rice, how long do I soak it for and how long does it take in the cuckoo rice cooker? I've read somewhere 4 hours! Argh... I had just made this but I had no idea that the grains needed to be soaked, especially since I used a regular rice cooker. Is what I made still edible? I purchased a package of T&T 10 multigrain rice, I have soaked it for 2 hours like the package says. When I cook it in the rice cooker, I am clearly doing it wrong, perhaps too much water? It come out looking like mushy hot cereal not rice. Do I drain the water it was soaked in? 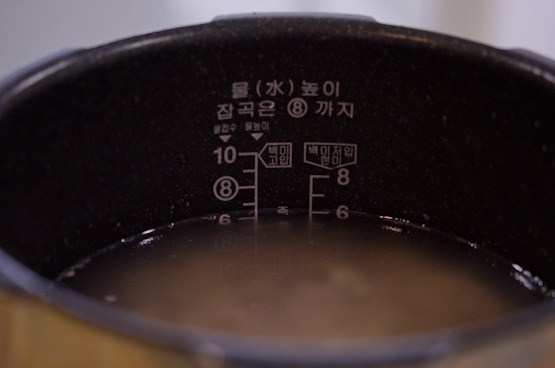 how much water should I add to cook it in the rice cooker? I have a Hamilton Beach Rice cooker with a whole grain setting. You don't want to cook with the water you soaked your grains in. Drain the water off and pour new water but a lot less amount. With minimum of 2 hours of soak time, I would put about 1:1.5 ratio of grain and water. 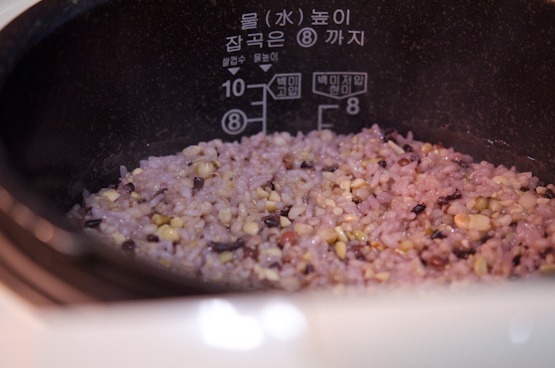 Some rice cooker with the whole grain setting turns the grains into a porridge. Try with the whole grain setting again and if it still turns into porridge, use the regular setting. Hope this helps. Thank you very much, worked much better now. Hope you have a Blessed and Joyous New Year. Thank you Holly for the information. 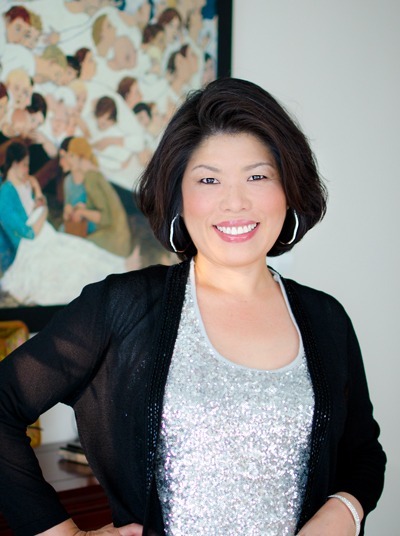 I have been cooking a 12-grain rice blend since 2005 when I worked with a Korean lady named Hyonmi. I LOVE it...soo earthy, delicious and satisfying. I usually soak overnight and use a rice cooker. I only cook a small amount since it is just for myself. Sometimes, I toss a little butter in at the end, and I think it's amazing. I never mix it with white rice, but it sounds like it could be good as well. 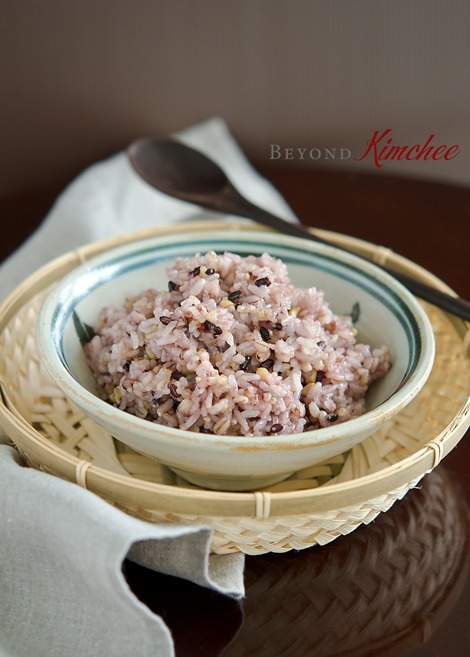 I was wondering; Besides being a side dish of 'purple rice' what other uses would you suggest. Is this something that is only eaten on the side or are there Korean dishes such as soups, stir frys, etc that it is used in. Thanks! Hello, these posts are all so great! I was wondering where I can purchase the baskets used to hold noodles or fried foods, or the ones used in the pictures on this article. I see this type of rice more and more in korean dramas and often wondered if it was just rice and beans (like in latin dishes). Now I know. I'll definitely have to give it a try and buy from my H-Mart store. Hi Holly, What would you recommend for cooking pressed barley with white rice in a rice cooker?